Fruits and veggies should form the foundation of any healthful diet, and adding watermelon to your meal plans supports your weight loss goals. The natural sweetness of each slice makes the melon more satisfying than fruits with lower sugar contents. 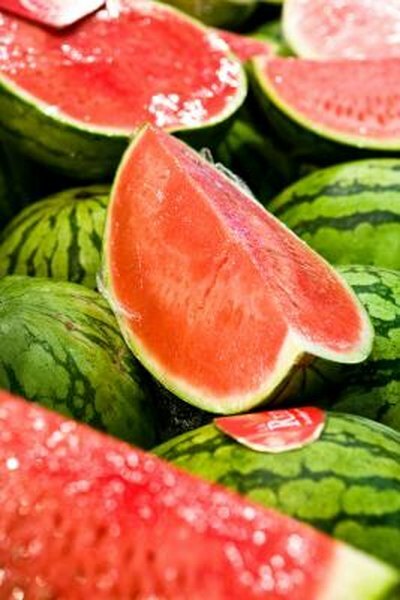 It’s tough to overindulge with watermelon due to its low calorie count, which makes it a satisfying diet food. When you're on a calorie-controlled diet, you can't afford to waste your calorie budget on empty calories that offer little nutritional value -- every food you eat needs to provide essential nutrients. A 2-cup serving of diced watermelon contains just 80 calories. Each serving offers 21 grams of carbohydrates -- with 20 grams coming from natural sugar -- no fat and no cholesterol. Each serving also packs 30 percent of a person’s daily requirement for vitamin A, 25 percent for vitamin C and 8 percent for potassium. This nutrient profile makes watermelon ideal for weight loss because it's low in calories and provides sugar to fuel an active lifestyle essential for weight loss. Watermelon has a low energy density, meaning that it has a small number of calories for a large serving. Foods with low energy densities are especially useful for weight loss because they fill people up without adding too many calories to their daily totals. One reason for watermelon’s low energy density is its high water content, which can also help keep you hydrated and may prevent cravings for cool desserts. In addition to boasting a low calorie count, watermelon has a number of health benefits that make it a wise choice for weight loss. The antioxidants present in watermelon may be able to improve the body’s natural immune system functions as well as reduce the risk of heart disease, according to the Cleveland Clinic. When eaten as part of a balanced diet, watermelon and other fruits may reduce risks of stroke, kidney stones, bone loss, diabetes and cancer. Watermelon makes a refreshing, low-calorie snack on its own when diced or cut into wedges. Grilled watermelon drizzled with honey is a tasty dessert option. For hydration, blend seedless watermelon with a squirt of honey and fresh mint to make a smoothie. You can also toss squares of watermelon into a cold green salad or use them as a fruit salad base. To be both safe and effective for weight loss, watermelon needs to be combined with other nutritious foods in a balanced, low-calorie diet that meets all nutritional needs. CNN’s Dr. Melina Jampolis cautions that eating too much watermelon or other fruits at the expense of the remaining food groups could lead to nutrient deficiencies or dietary imbalances. Before making any big changes to your diet, it’s advisable to talk with a registered dietitian or your doctor.